Explore the Everglades National Park on this 3-hour tour from Miami. 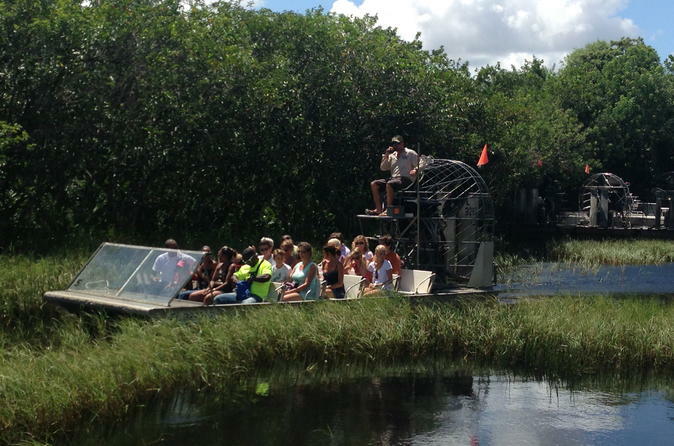 Glide along the water on an airboat ride and listen to expert commentary from both your tour guide and airboat captain. Total 3 hour duration of this tour begins upon hotel pickup, and all taxes and fees are included. After hotel pickup, you will be escorted by your knowledgeable guide who will be at your service for the duration of the tour. Learn Interesting facts and details regarding the Everglades unique ecosystem. The Everglades National Park is made up of 1.2 million acres of grasslands. You will enjoy an exhilarating ride aboard a flat propelled airboat gliding atop the shallow surface of the water. Within this preserved wilderness you will see breathtaking panoramic views, lush vegetation and feel the beautiful tranquility of nature. A paradise of birds, fish, tortoises, alligators and other wildlife will surround you. Your airboat captain will provide you with full narration. Following your airboat experience you will have the pleasure of attending a wildlife show full of indigenous animals and interesting details about this exotic world. After the show walk around and take advantage of the excellent educational exhibits before your relaxing ride back to your hotel.